Please download, print, and complete the Scholarship Application form. Be sure that you include the two reference letters requested at the bottom of the form along with your $25 registration fee. The Scholarship Application along with your two reference letters and registration fee must be postmarked by April 15, 2019. Scholarship applications received without the registration fee will not be considered for scholarship funds. REMEMBER: ALL students pay the $25 registration fee--even those who receive scholarships. Each year a number of special scholarships are presented to students at the closing concert for the next year. 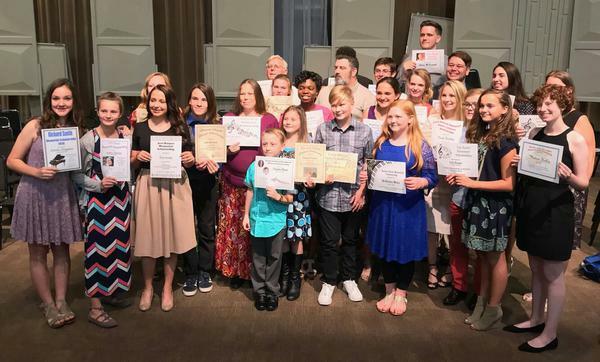 These scholarships are given in honor of, or in memory of, individuals who have contributed greatly to the preservation of southern gospel music. Congratulations to all of our Scholarship Award Winners!! Interested in starting your own scholarship? We invite supporters of TSGSM and gospel music to establish annual scholarships to provide an opportunity for worthy students to be able to attend the TSGSM. For additional information to set up a scholarship please visit our donation page here.